Well, here's the fantastic ORPHEUS AND EURIDICE that LBO turned out...in time lapse. You can even catch the pre-opera talk with Ricky & Andreas if you don't blink. I did two others and will post one more in a day or so...after I get the footage of the Best Curtain Call EVER in order. Wanna guess what we all did after the bows on closing night? Orpheus and Euridice Tech...with life jackets! We're coming down to the wire in Long Beach with one of the more interesting sets of challenges (technical and artistic) that I've seen in recent years: the LBO's production of Ricky Ian Gordon's ORPHEUS AND EURIDICE at the Belmont Shores Olympic Pool Complex. 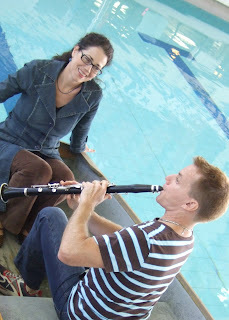 That's Elizabeth Futral and Todd Palmer in the title roles...and in the water! The sound has turned out amazingly well, and tonight we'll get a look at lights and set. I was able to load in my video projections on Monday and things are looking good. The only problem (aside from the constant fear of water + electricity) is that much of the show has to be set up and struck every day. We've got three performances (Sunday-Monday-Tuesday 2/17-2/19) and three nights of tech and dress. 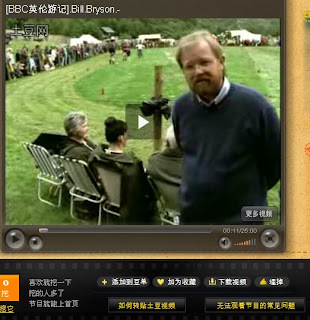 Recently I've been reading and researching Bill Bryson's work, and in my travels I came across some interesting video of him from a most unlikely location: Shanghai. That is the home of Tudou, China's largest video sharing website. I saw an episode of his BBC series NOTES FROM A SMALL ISLAND (based on his wonderful book and unavailable on this side of the Pond). My Chinese isn't what it ought to be, but I was able to figure out the design of Tudou well enough to find five more episodes posted by a Chinese fan of Bryson's. They are a little trucated, but well worth watching. Bryson's idiosyncratic tour is entertaining, and he himself is a fascinating product of Iowa roots and British soil. Dry, droll, and yet a man from the heartland. Best of all for doc makers is the cinematography: the interviews are often shot at a distance with a lot of foreground: there's a fascinating combination of physical distance and conversational initimacy throughout...and some of it's just flat-out beautiful even as it's being streamed from half a world away.